This highly versatile cream can be used either day or night, and suitable for all skin types, particularly dry and mature. 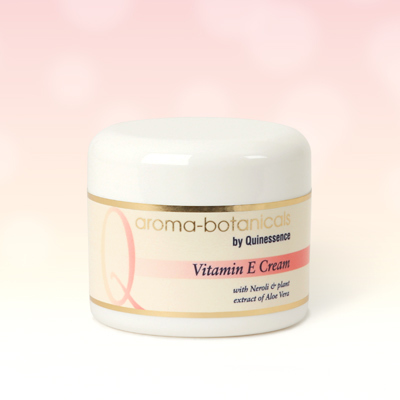 In the Natural Health & Beauty Awards 2007, Aroma-botanicals® Vitamin E Cream fought off stiff competition to scoop the 'Highly Commended' award in the category of 'Best Moisturiser'. The Awards, published in Natural Health magazine's March issue, recognised the key selling points of the Quinessence Aroma-botanicals brand - an all-natural range without the usual hefty price tag. Despite modern advances, vitamin E still remains one of the finest natural anti-oxidants, neutralising the effects of free radicals and environmental damage. Aqua, Glyceryl Stearate SE, Dicaprylyl Maleate, Glycerin, Aloe barbadensis, Stearic Acid, Glyceryl Polymethacrylate, Cetearyl Alcohol, Ethylhexyl Dimethyl PABA, Prunus dulcis, Carthamus tinctorius, Rosa rubiginosa, Tocopheryl Acetate, Ceteareth-20, Triethanolamine, Citrus aurantium amara, Carbomer, Xanthan Gum, Pogostemon cablin, Allantoin, Disodium EDTA, Gluconolactone, Sodium benzoate, Calcium gluconate, CI 19140.